Six months after landing a deal on Dragons’ Den, Leila Keshavjee’s Happy Pops startup – forged with the help of the University of Toronto’s entrepreneurship network – is poised to move into more grocers’ freezers across the country. “We will continue to do our events and catering, but we will also be expanding more into retail – I think we’re a lot readier for that now,” says Keshavjee, who inked a $150,000 deal with Arlene Dickinson on the hit CBC television show back in September. Keshavjee founded Happy Pops in 2016 after she spotted an ice pops business for sale. She has since grown the business by catering events, negotiating shelf space with retailers and, generally, winning over customers with her high quality frozen ice pops made from real fruit, organic sugar and very little water. 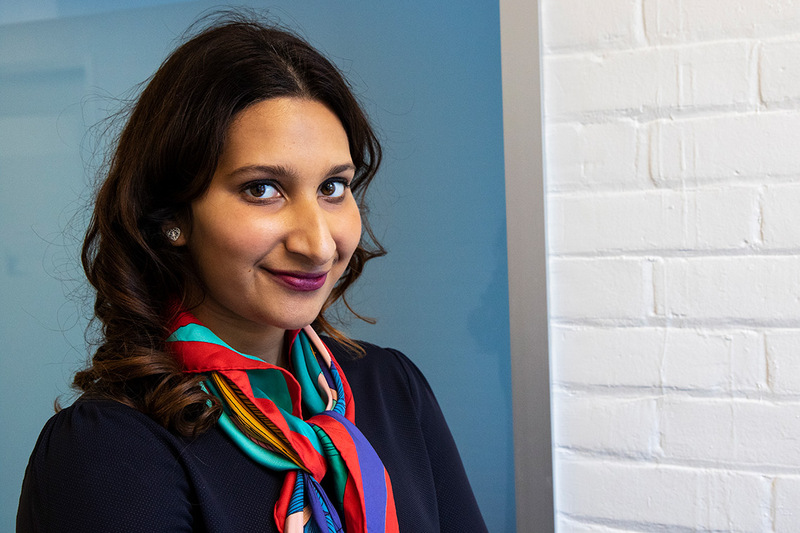 Keshavjee, who recently spoke at a female founders event, says launching a consumer products business wasn’t easy as a woman – “People don’t take you as seriously” – and that the bank initially refused to extend her credit limit beyond $1,000. By contrast, she says U of T provided her with significant support. That includes working with the university’s Impact Centre accelerator, one of nine entrepreneurship hubs on campus. So what advice does Keshavjee have for other students, including women, who might be thinking of starting a company? U of T News caught up with Keshavjee to find out. How was your experience working with Arlene Dickinson’s accelerator? It was really good. Food and beverage is a really different space, and there’s not a lot of resources out there for those kinds of companies. It’s also difficult to find capital. Arlene has the only food and beverage venture capital fund in the country. So it was really cool to get the investment and be part of her program. Did you come away from that experience learning something you didn’t know before? Yes. Understanding all the different pieces of the puzzle – the supply chain, the brokers, the distributors and how everyone fits together. It was also an opportunity to be surrounded by other people facing similar issues, so you can learn from each other. It’s about understanding how to strategize, build and grow a company. We got some great traction after Dragons’ Den. There’s so much potential, so understanding how to take Happy Pops to the next step was what I really got out of it. Has the company’s focus changed at all as a result? Not really. We will continue to do our events and catering, but we will also be expanding more into retail. I think we’re a lot readier for that now. We’ve proven the concept with a few retailers and all of our corporate customers. How many stores are you in now? We’re in about 20 stores – mostly in Ontario. We will be launching with a larger chain in a couple months. What’s been your experience building a consumer products company – and doing it as woman? You hear so much about gender equality and that women can do everything that men can. And that’s very true. But when it comes to getting bank financing and those sorts of things, I think it’s still a lot harder as a female. I’ve come to that conclusion. Now, I’ve been on Dragons' Den and so I now have a more established name – so it’s no longer quite as challenging. But looking back, I think some of the challenges I faced were partly due to gender. Just being young and female, I don’t think people take you as seriously. Do you think the ecosystem in place to help startups is too geared toward males? The whole ecosystem is very male-dominated. There are significantly more men than women. Of course, there’s a decent number of Canadian women who have done great things – people like Arlene Dickinson, who I look up to. She paved the way and showed that women can be very successful entrepreneurs. I recall Arlene Dickinson talking about the challenges she faced – people telling her what she should and shouldn’t do. I think it’s like that for a lot of people. For me, people were saying, “How are you going to make a career selling popsicles?” or “Why did you turn down doing your master’s at U of T – are you crazy?” But if I was a male, coming out of the same program, and said I was starting a tech company, people probably would have applauded it. I would have been the coolest person. But the chances of failing in tech are actually a lot higher than some of these other industries because you need so much capital. Were you able to get what you needed to launch your company at U of T, or did you need to look elsewhere for support? The support has been there – and is still there. I think having the backing of the university has definitely helped accelerate my business. It also exposed me to different situations and trained me how to convey my product in different environments. It’s great that the university has supported a non-tech company. It just shows that there are so many opportunities. We’re seeing more and more entrepreneurs coming out of university. From the moment I decided I wanted to launch a startup, the university was very supportive. What advice would you give other students who have an idea for a company? It’s definitely going to be very different from what your friends are doing. But I think you should try. If someone said you could get into any university program you wanted tomorrow, I still wouldn’t go back and change what I did – even if someone paid me. I loved the process even though it wasn’t easy. I definitely made mistakes. I’ve learned so much in just two and a half years. Do you think there’s a lot of risk in taking the entrepreneurship path? Had it not been for the Impact Centre – which said, ‘Just go for it’ – I probably would have never done it. But the moment I knew the university was behind me, I was like, ‘The university is behind me to do this?’ I knew right there that this is what I wanted to do.